Steve Long FRS is Gutgesell Endowed University of Illinois Professor of Crop Sciences and Distinguished Professor of Crop Sciences at the University of Lancaster, UK. His photosynthesis research spans from molecular and in silico design to field analysis of performance. This has been applied in increasing genetic crop yield potential and adaptation to global change. He has identified the most productive terrestrial plants so far known from the wild and has studied the attributes that set them apart. 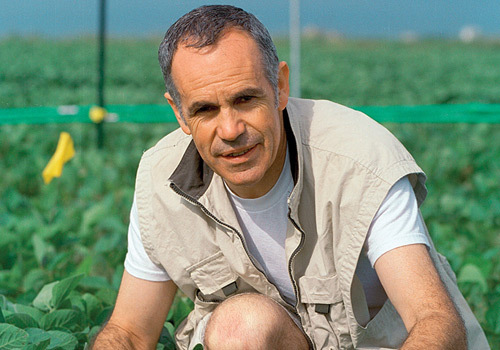 At Illinois he led the development of SoyFACE; the world’s largest facility for understanding the impacts of atmospheric change on our major food crops under open air field conditions. This has been integrated with his photosynthesis work to understand the direct mechanisms be which plants respond to the interactive effects of rising CO2, surface ozone, temperature and atmospheric water vapour deficit. These in term have been integrated into models of the direct responses of crops to global change. He is currently Director of Bill & Melinda Gates Foundation international project on Realizing Increased Photosynthetic Efficiency (RIPE). He is listed by ISI as one of the Most Highly Cited Authors of 2016. He was recently awarded the Marsh Award for Climate Change Research from the British Ecological Society, the Innovation Award of the International Society for Photosynthesis Research; and the Newton-Abrahams Visiting Professorship of Oxford University, UK. He is Founding and Chief Editor of “Global Change Biology” and of “GCB Bioenergy”. He is Chair of the Royal Society Section on Organismal Biology, Ecology and Evolution. He has given invited presentations on bioenergy, climate change impacts and food security to President Bush at the White House, to the Vatican and to Bill Gates. He serves in advisory roles on key agricultural committees in the US, UK and EU.